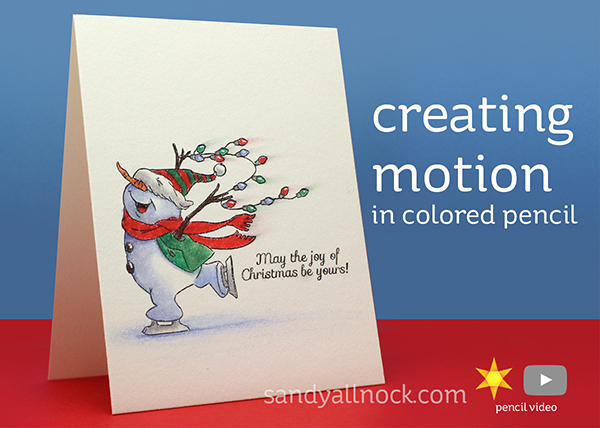 When I saw this little skating snowman, I wanted to make the lights really fly as he soared across the ice, and found a super easy way to create the motion. Watch the video below or click HERE to see it in HD on YouTube. Fun card! Thank you for the tips for creating motion. Thank you. I have a ton of Prisma Color pencils and always love to see ways to use them. And no you don’t have too much snow on the JOY card. That’s one of features I loved. I’m assuming you made the snow with a white gel pen? I have the worse luck with my white gel pens. I wish I could get snow to look like that. Thank you again Sandy. Love the snowman. Thank you for the technique instructions! Love watching your videos. Oh, I love the super-snow! So cute! This is a great image and I love how you created the sense of movement. I also like the shadowing next to the skate. I totally agree that we should be supporting the originators who put their hearts into creating and producing crafting products. A designer friend said that if you see images on a knock off site to report the site to the original company so that they can take action. This is a wonderful image and I love how you’ve given it some action. I also like how you shadowed the ice next to his skate. Some of my friends were lured by the lower prices of a knock off company from China. We’ve tested their products and found them quite inferior. I asked one of the designers that I know and she said to notify the original company so they can take legal action. Crafters need to support these companies who have put their hearts into designing and producing good products. Sorry my soap box as a former stamp retailer. 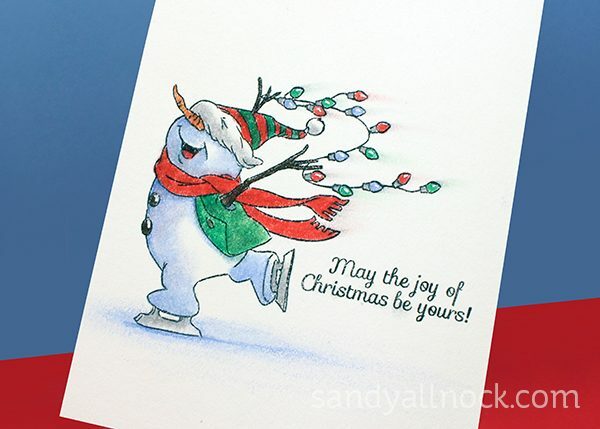 Wonderful cards, I love how he is rushing across the ice! I love your work. I wish I was a talented as you. 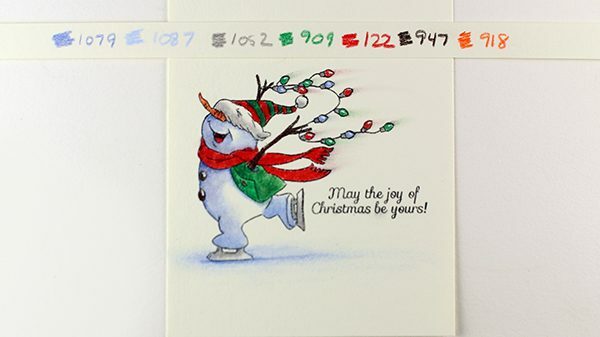 Love,love your tags and cards. I also love your ideas on bible journaling. You have inspired me so much. I love your cards, you are so talented! These counterfeiters make me so mad. I have always despised a thief and that is what they are. I don’t know why people would want such a low-quality product. I’ll stick with the originals or just look and dream. Lovely cards with pretty colors ! Thanks for the video and tips. I love all the cards on this post. I live in Chico and your videos provided a brief diversion during this horrible disaster in Butte Co. Appreciate everyone’s prayers for Paradise. This is just so fun! Fabulous Sandy, I love to watch and hear you teaching us. Great that you did this card with pencils, thanks for that. It’s a shame that crafters like you have to wring in yourself in all kinds of turns to make a photo or a video of stamps so that certain people it won’t copy. An absolutely precious card!!! Thanks so much for sharing the “motion” technique – it’s really easy, but very effective! And, I will be alert about the counterfeit stamps because of your “rant” TFS! Your video is fabulous, love how simple that to show motion is, I even have a stump & crayons so no expensive gizmo, thanks. You’re 100% right on counterfeit goods. If we as consumers refused to buy any from craft or any fields then this would wipe out their industry.No to any counterfeit anything ! Thanks also for raising awareness about the counterfeiting problem. You are so right in saying that people need to stop buying inferior counterfeit products. I feel so bad for designers and businesses whose designs are being ripped off. Thank you so much for the soap box share! 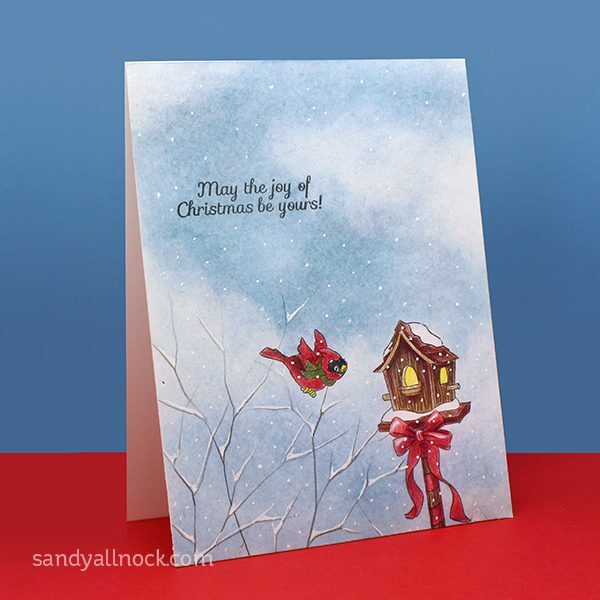 Cute as always Sandy Just one question, paper type used? And I agree about the counterfeit issue. A while ago, Catherine Pooler showed one of her ripped-off stamp sets, typos and all… So sad.